The James Monroe Tomb is the burial place for U.S. President James Monroe in Hollywood Cemetery, Richmond, Virginia, United States. 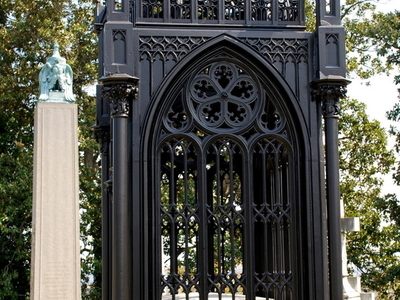 The site is "significant for the execution of its flamboyant and delicate tracery in cast iron, the tomb is a cage over the simple granite sarcophagus of the former President, who died and was buried in New York City in 1831, but was removed to Virginia in 1858." It has been given the local nickname of "The Birdcage". Here's the our members favorite photos of "Cemeteries in Richmond". Upload your photo of James Monroe Tomb!